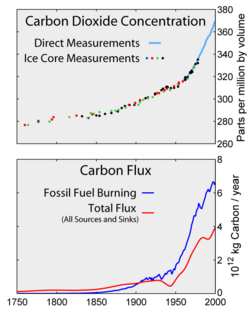 Top: Increasing atmospheric CO2 levels as measured in the atmosphere and ice cores. Bottom: The amount of net carbon increase in the atmosphere, compared to carbon emissions from burning fossil fuel. Greenhouse gases (GHGs) is the name given to a number of gases present in the earth's atmosphere which reduce the loss of heat into space and therefore contribute to global temperatures through the greenhouse effect. These gases are essential to maintaining the temperature of the Earth and without them the planet would be so cold as to be uninhabitable. The most important greenhouse gas is water vapor which creates clouds. The vast bulk of this is produced by the natural process of evaporation of water from the sea. An excess of greenhouse gases can raise the temperature of a planet to lethal levels, as on Venus where the 90 bar partial pressure of carbon dioxide (CO2) contributes to a surface temperature of about 467 °C (872 °F). Carbon dioxide is produced by many natural and industrial processes, which currently result in CO2 levels of 380 ppmv in the atmosphere. The reason for such a low level of carbon dioxide is that CO2 is quickly taken up by plants through photosynthesis and converted into carbohydrates. Based on ice-core samples and records (see graphs) current levels of CO2 are approximately 100 ppmv higher than during immediately pre-industrial times, when direct human influence was negligible. "Greenhouse gases" are essential to maintaining the temperature of the Earth—without them the planet would be so cold as to be uninhabitable. When sunlight reaches the surface of the Earth, some of it is absorbed and warms the surface. Because the Earth's surface is much cooler than the sun, it radiates energy at much longer wavelengths than the sun does, peaking in the infrared at about 10 µm. The atmosphere absorbs these longer wavelengths more effectively than it does the shorter wavelengths from the sun. The absorption of this longwave radiant energy warms the atmosphere; the atmosphere is also warmed by transfer of sensible and latent heat from the surface. Greenhouse gases also emit longwave radiation both upward to space and downward to the surface. The downward part of this longwave radiation emitted by the atmosphere is the "greenhouse effect." The term is a misnomer though, as this process is not the mechanism that warms greenhouses. Note that this is a combination of the strength of the greenhouse effect of the gas and its abundance. For example, methane is a much stronger greenhouse gas than CO2, but present in much smaller concentrations. It is not possible to state that a certain gas causes a certain percentage of the greenhouse effect, because the influences of the various gases are not additive. (The higher ends of the ranges quoted are for the gas alone; the lower ends, for the gas counting overlaps.) Other greenhouse gases include, but are not limited to, nitrous oxide, sulfur hexafluoride, hydrofluorocarbons, perfluorocarbons and chlorofluorocarbons (see IPCC list of greenhouse gases). A significant greenhouse gas not yet addressed by the IPCC (or the Kyoto Protocol) is nitrogen trifluoride. The major atmospheric constituents (nitrogen, N2 and oxygen, O2) are not greenhouse gases. This is because homonuclear diatomic molecules such as N2 and O2 neither absorb nor emit infrared radiation, as there is no net change in the dipole moment of these molecules when they vibrate. Molecular vibrations occur at energies that are of the same magnitude as the energy of the photons on infrared light. Heteronuclear diatomics such as CO or HCl absorb IR; however, these molecules are short-lived in the atmosphere owing to their reactivity and solubility. As a consequence they do not contribute significantly to the greenhouse effect. 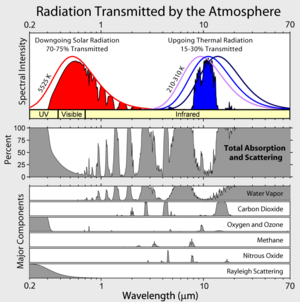 Late nineteenth-century scientists experimentally discovered that N2 and O2 did not absorb infrared radiation (called, at that time, "dark radiation") and that CO2 and many other gases did absorb such radiation. It was recognized in the early twentieth century that the known major greenhouse gases in the atmosphere caused the earth's temperature to be higher than it would have been without the greenhouse gases. 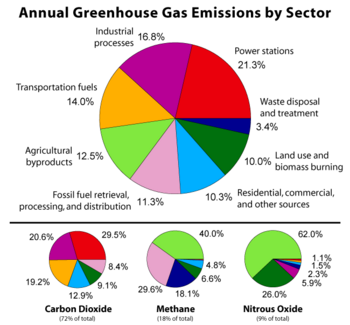 Most greenhouse gases have both natural and anthropogenic sources. During the pre-industrial holocene, concentrations of these gases were roughly constant. Since the industrial revolution, concentrations of all the long-lived greenhouse gases have increased due to human actions. Ice cores provide evidence for variation in greenhouse gas concentrations over the past 800,000 years. Both CO2 and CH4 vary between glacial and interglacial phases, and concentrations of these gases correlate strongly with temperature. Before the ice core record, direct measurements do not exist. Various proxies and modeling suggests large variations; 500 millions years ago CO2 levels were likely 10 times higher than now. Indeed higher CO2 concentrations are thought to have prevailed throughout most of the Phanerozoic eon, with concentrations four to six times current concentrations during the Mesozoic era, and ten to fifteen times current concentrations during the early Palaeozoic era until the middle of the Devonian period, about 400 million years ago. The spread of land plants is thought to have reduced CO2 concentrations during the late Devonian, and plant activities as both sources and sinks of CO2 have since been important in providing stabilizing feedbacks. Earlier still, a 200-million year period of intermittent, widespread glaciation extending close to the equator (Snowball Earth) appears to have been ended suddenly, about 550 million years ago, by a colossal volcanic outgassing which raised the CO2 concentration of the atmosphere abruptly to 12 percent, about 350 times modern levels, causing extreme greenhouse conditions and carbonate deposition as limestone at the rate of about 1mm per day. This episode marked the close of the Precambrian eon, and was succeeded by the generally warmer conditions of the Phanerozoic, during which multicellular animal and plant life evolved. No volcanic carbon dioxide emission of comparable scale has occurred since. In the modern era, emissions to the atmosphere from volcanoes are only about 1 percent of emissions from human sources. 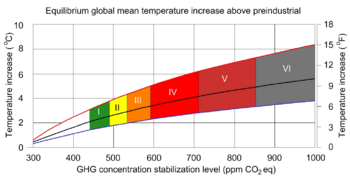 The projected temperature increase for a range of greenhouse gas stabilization scenarios (the colored bands). The black line in middle of the shaded area indicates 'best estimates'; the red and the blue lines the likely limits. From the work of IPCC AR4, 2007. Since about 1750, human activity has increased the concentration of carbon dioxide and of some other important greenhouse gases. Natural sources of carbon dioxide are more than 20 times greater than sources due to human activity, but over periods longer than a few years natural sources are closely balanced by natural sinks such as weathering of continental rocks and photosynthesis of carbon compounds by plants and marine plankton. As a result of this balance, the atmospheric concentration of carbon dioxide remained between 260 and 280 parts per million for the 10,000 years between the end of the last glacial maximum and the start of the industrial era. burning of fossil fuels and deforestation leading to higher carbon dioxide concentrations. Land use change (mainly deforestation in the tropics) account for up to one-third of total anthropogenic CO2 emissions. The U.S. EPA ranks the major greenhouse gas contributing end-user sectors in the following order: industrial, transportation, residential, commercial and agricultural. Major sources of an individual's GHG include home heating and cooling, electricity consumption, and transportation. Corresponding conservation measures are improving home building insulation, compact fluorescent lamps and choosing energy-efficient vehicles. Water vapor is a naturally occurring greenhouse gas and accounts for the largest percentage of the greenhouse effect, between 36 percent and 66 percent. Water vapor concentrations fluctuate regionally, but human activity does not directly affect water vapor concentrations except at local scales (for example, near irrigated fields). The Clausius-Clapeyron relation establishes that warmer air can hold more water vapor per unit volume. Current state-of-the-art climate models predict that increasing water vapor concentrations in warmer air will amplify the greenhouse effect created by anthropogenic greenhouse gases while maintaining nearly constant relative humidity. Thus water vapor acts as a positive feedback to the forcing provided by greenhouse gases such as CO2. Measurements from Antarctic ice cores show that just before industrial emissions started, atmospheric CO2 levels were about 280 parts per million by volume (ppm; the units µL/L are occasionally used and are identical to parts per million by volume). From the same ice cores it appears that CO2 concentrations stayed between 260 and 280 ppm during the preceding 10,000 years. However, because of the way air is trapped in ice and the time period represented in each ice sample analyzed, these figures are long term averages not annual levels. Studies using evidence from stomata of fossilized leaves suggest greater variability, with CO2 levels above 300 ppm during the period 7,000–10,000 years ago, though others have argued that these findings more likely reflect calibration/contamination problems rather than actual CO2 variability. 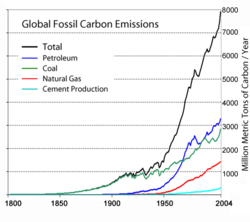 Global anthropogenic Carbon emissions 1751–2004. (Source: IPCC radiative forcing report 1994 updated (to 1998) by IPCC TAR table 6.1  ). The sharp acceleration in CO2 emissions since 2000 of >3% y−1 (>2 ppm y−1) from 1.1% y−1 during the 1990s is attributable to the lapse of formerly declining trends in carbon intensity of both developing and developed nations. Although over 3/4 of cumulative anthropogenic CO2 is still attributable to the developed world, China was responsible for most of global growth in emissions during this period. Localized plummeting emissions associated with the collapse of the Soviet Union have been followed by slow emissions growth in this region due to more efficient energy use, made necessary by the increasing proportion of it that is exported. In comparison, methane has not increased appreciably, and N2O by 0.25% y−1. The direct emissions from industry have declined due to a constant improvement in energy efficiency, but also to a high penetration of electricity. If one includes indirect emissions, related to the production of electricity, CO2 emissions from industry in Europe are roughly stabilized since 1994. Atmospheric levels of CO2 have set another new peak, partly a sign of the industrial rise of Asian economies led by China. Over the 2000-2010 interval, China is expected to increase its carbon dioxide emissions by 600 Mt, largely because of the rapid construction of old-fashioned power plants in poorer internal provinces. The United States emitted 16.3 percent more GHG in 2005 than it did in 1990. According to a preliminary estimate by the Netherlands Environmental Assessment Agency, the largest national producer of CO2 emissions since 2006 has been China with an estimated annual production of about 6200 megatonnes. China is followed by the United States with about 5,800 megatonnes. However the per capita emission figures of China are still about one quarter of those of the US population. Relative to 2005, China's fossil CO2 emissions increased in 2006 by 8.7 percent, while in the USA, comparable CO2 emissions decreased in 2006 by 1.4 percent. The agency notes that its estimates do not include some CO2 sources of uncertain magnitude. These figures rely on national CO2 data that do not include aviation. Although these tonnages are small compared to the CO2 in the Earth's atmosphere, they are significantly larger than pre-industrial levels. 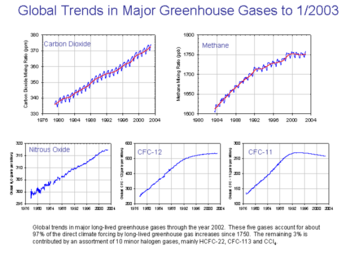 Atmospheric carbon dioxide concentration is increasing at an increasing rate. In the 1960s, the average annual increase was only 37 percent of what it was in 2000 through 2007. Aside from water vapor, which has a residence time of days, it is believed that most greenhouse gases take many years to leave the atmosphere. as a consequence of chemical reactions within the atmosphere. This is the case for methane. It is oxidized by reaction with naturally occurring hydroxyl radical, OH• and degraded to CO2 and water vapor at the end of a chain of reactions (the contribution of the CO2 from the oxidation of methane is not included in the methane Global warming potential). This also includes solution and solid phase chemistry occurring in atmospheric aerosols. as a consequence of a chemical change at the interface between the atmosphere and the other compartments of the planet. This is the case for CO2, which is reduced by photosynthesis of plants, and which, after dissolving in the oceans, reacts to form carbonic acid and bicarbonate and carbonate ions (see ocean acidification). as a consequence of a photochemical change. Halocarbons are dissociated by UV light releasing Cl• and F• as free radicals in the stratosphere with harmful effects on ozone (halocarbons are generally too stable to disappear by chemical reaction in the atmosphere). as a consequence of dissociative ionization caused by high energy cosmic rays or lightning discharges, which break molecular bonds. For example, lightning forms N anions from N2 which then react with O2 to form NO2. The atmospheric lifetime of a species therefore measures the time required to restore equilibrium following an increase in its concentration in the atmosphere. Individual atoms or molecules may be lost or deposited to sinks such as the soil, the oceans and other waters, or vegetation and other biological systems, reducing the excess to background concentrations. The average time taken to achieve this is the mean lifetime. The atmospheric lifetime of CO2 is often incorrectly stated to be only a few years because that is the average time for any CO2 molecule to stay in the atmosphere before being removed by mixing into the ocean, photosynthesis, or other processes. However, this ignores the balancing fluxes of CO2 into the atmosphere from the other reservoirs. It is the net concentration changes of the various greenhouse gases by all sources and sinks that determines atmospheric lifetime, not just the removal processes. CO2 has a variable atmospheric lifetime, and cannot be specified precisely. Recent work indicates that recovery from a large input of atmospheric CO2 from burning fossil fuels will result in an effective lifetime of tens of thousands of years. Carbon dioxide is defined to have a GWP of 1 over all time periods. CFC-12 has an atmospheric lifetime of 100 years and a GWP of 10600 over 100 years. HCFC-22 has an atmospheric lifetime of 12.1 years and a GWP of 1700 over 100 years. Tetrafluoromethane has an atmospheric lifetime of 50,000 years and a GWP of 5700 over 100 years. Sulfur hexafluoride has an atmospheric lifetime of 3,200 years and a GWP of 22000 over 100 years. Airborne fraction (AF) is the proportion of an emission (e.g. CO2) remaining in the atmosphere after a specified time. Canadell (2007) define the annual AF as the ratio of the atmospheric CO2 increase in a given year to that year’s total emissions, and calculate that of the average 9.1 PgC y-1 of total anthropogenic emissions from 2000 to 2006, the AF was 0.45. 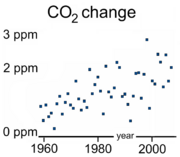 For CO2 the AF over the last 50 years (1956-2006) has been increasing at 0.25±0.21%/year. The global warming potential (GWP) depends on both the efficiency of the molecule as a greenhouse gas and its atmospheric lifetime. 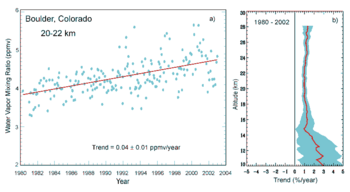 GWP is measured relative to the same mass of CO2 and evaluated for a specific timescale. Thus, if a molecule has a high GWP on a short time scale (say 20 years) but has only a short lifetime, it will have a large GWP on a 20 year scale but a small one on a 100 year scale. Conversely, if a molecule has a longer atmospheric lifetime than CO2 its GWP will increase with time. Another potentially important indirect effect comes from methane, which in addition to its direct radiative impact also contributes to ozone formation. Shindell et al. (2005) argue that the contribution to climate change from methane is at least double previous estimates as a result of this effect. ↑ Thomas R. Karl and Kevin E. Trenberth, Modern Global Climate Change. Science 302(5651) (2003):1719-1723. Retrieved August 7, 2008. ↑ 2.0 2.1 Le Treut, H., R. Somerville, U. Cubasch, Y. Ding, C. Mauritzen, A. Mokssit, T. Peterson and M. Prather, Historical Overview of Climate Change Science. in Solomon, S., D. Qin, M. Manning, Z. Chen, M. Marquis, K.B. Averyt, M. Tignor and H.L. Miller (eds. ), Climate Change 2007: The Physical Science Basis. 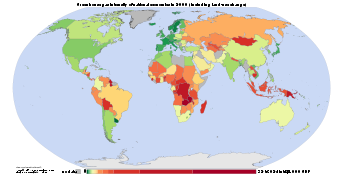 Contribution of Working Group I to the Fourth Assessment Report of the Intergovernmental Panel on Climate Change (Cambridge, UK: Cambridge University Press, 2007, ISBN 9780521880091). ↑ J.T. 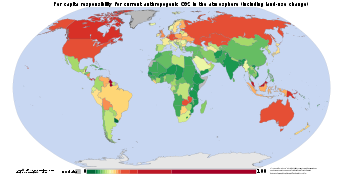 Kiehl, and Kevin E. Trenberth Earth’s Annual Global Mean Energy Budget. Bulletin of the American Meteorological Society 78(2) (1997):197–208. Retrieved August 7, 2008. ↑ 4.0 4.1 Water vapour: feedback or forcing? 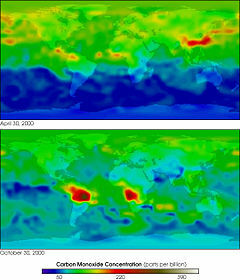 RealClimate (2005). Retrieved August 7, 2008. ↑ Michael J. Prather, and J. Hsu, NF3, the greenhouse gas missing from Kyoto. Geophysical Research Letters. 35 (2008):L12810. Retrieved August 7, 2008. ↑ Robert A. Berner, GEOCARB II: a revised model of atmospheric CO2 over Phanerozoic time. American Journal of Science 294 (1994):56–91. Retrieved August 7, 2008. ↑ D.L. Royer, R.A. Berner, and D.J. Beerling, "Phanerozoic atmospheric CO2 change: evaluating geochemical and paleobiological approaches," Earth-Science Reviews 54 (2001):349-392. ↑ Robert A. Berner, and Zavareth Kothavala, GEOCARB III: a revised model of atmospheric CO2 over Phanerozoic time. American Journal of Science 301(2) (2001):182-204. Retrieved August 7, 2008. ↑ D.J. Beerling and R.A. Berner, "Feedbacks and the co-evolution of plants and atmospheric CO2." Proceedings of the National Academy of Science 102 (2005):1302-1305. ↑ 11.0 11.1 P.F. Hoffmann, A.J. Kaufman, G.P. Halverson, and D.P. Schrag, "A neoproterozoic snowball earth." Science 281 (1998):1342-1346. Retrieved August 7, 2008. ↑ T.M. Gerlach, "Present-day CO2 emissions from volcanoes." Transactions of the American Geophysical Union 72 (1991):249-255. ↑ Climate Change 2001: Working Group I: The Scientific Basis: figure 6-6. IPCC. Retrieved August 8, 2008. ↑ The present carbon cycle - Climate Change. UNEP. Retrieved August 8, 2008. ↑ 15.0 15.1 S. Solomon, D. Qin, M. Manning, Z. Chen, M. Marquis, K.B. Averyt, M. Tignor and H.L. Miller (eds. ), Climate Change 2007: The Physical Science Basis. Contribution of Working Group I to the Fourth Assessment Report of the Intergovernmental Panel on Climate Change. (Cambridge, UK: Cambridge University Press, 2007, ISBN 9780521880091) Chapter 7. Retrieved August 8, 2008. ↑ H. Steinfeld, P. Gerber, T. Wassenaar, V. Castel, M. Rosales, and C. de Haan, "Livestock’s long shadow," Environmental issues and options. 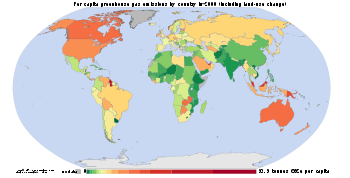 FAO Livestock, Environment and Development (LEAD) Initiative, 2006. ↑ 17.0 17.1 M.R. Raupach, et al., Global and regional drivers of accelerating CO2 emissions. Proc. Nat. Acad. Sci. 104(24) (2007):10288–10293. Retrieved August 8, 2008. ↑ U.S. Greenhouse Gas Inventory - U.S. Greenhouse Gas Inventory Reports. EPA. Retrieved August 8, 2008. ↑ K. Lee Lerner and Brenda Wilmoth Lerner, Environmental Issues: Essential Primary Sources. (Detroit, MI: Thomson Gale, 2006, ISBN 9781414406251). ↑ Isaac M. Held, Brian J. Soden, Robust Responses of the Hydrological Cycle to Global Warming. Journal of Climate 19(21) (2006):5686–5699. Retrieved August 8, 2008. ↑ Friederike Wagner, Bent Aaby, and Henk Visscher, "Rapid atmospheric CO2 changes associated with the 8,200-years-B.P. cooling event." PNAS. 99(19) (2002):12011–12014. ↑ Andreas Indermühle, Bernhard Stauffer, and Thomas F. Stocker, Early Holocene Atmospheric CO2 Concentrations. Science 286(5446) (1999):1815. Retrieved August 8, 2008. ↑ H.J. Smith, M. Wahlen and D. Mastroianni, "The CO2 concentration of air trapped in GISP2 ice from the Last Glacial Maximum-Holocene transition." Geophysical Research Letters 24(1) (1997):1–4. ↑ Monthly Average Carbon Dioxide Concentration. Mauna Loa Observatory. Retrieved August 8, 2008. ↑ Barry Jagoda, UC Analysis Shows Alarming Increase in Expected Growth of China's Carbon Dioxide Emissions. UC San Diego (2008). Retrieved August 8, 2008. ↑ Emissions inventory from the EPA. Science News 171:318. ↑ China now no. 1 in CO2 emissions; USA in second position. MNP. Retrieved August 8, 2008. ↑ Pieter Tans, "Annual CO2 mole fraction increase (ppm)" for 1959-2007. National Oceanic and Atmospheric Administration. Earth System Research Laboratory, Global Monitoring Division, 2008. Retrieved August 8, 2008. ↑ K.A. Masarie and P.P. Tans, "Extension and integration of atmospheric carbon dioxide data into a globally consistent measurement record." J. Geopys. Research 100 (1995):11593-11610. ↑ 30.0 30.1 Daniel Jacob, Introduction to Atmospheric Chemistry (Princeton, NJ: Princeton University Press, 1999, ISBN 0691001855), 25-26. ↑ Frequently Asked Question 7.1 "Are the Increases in Atmospheric Carbon Dioxide and Other Greenhouse Gases During the Industrial Era Caused by Human Activities?" in S. Solomon, D. Qin, M. Manning, Z. Chen, M. Marquis, K.B. Averyt, M. Tignor and H.L. Miller eds. Climate Change 2007: The Physical Science Basis. Contribution of Working Group I to the Fourth Assessment Report of the Intergovernmental Panel on Climate Change. Cambridge, UK: Cambridge University Press. ISBN 9780521880091. Retrieved August 8, 2008. ↑ David Archer, Fate of fossil fuel CO2 in geologic time. Journal of Geophysical Research. 110(C9) (2005): C09S05.1–C09S05.6. Retrieved August 8, 2008. ↑ Ken Caldeira and Michael E. Wickett, Ocean model predictions of chemistry changes from carbon dioxide emissions to the atmosphere and ocean. Journal of Geophysical Research. 110 (C9) (2005):C09S04.1–C09S04.12. Retrieved August 8, 2008. ↑ Use of ozone depleting substances in laboratories. TemaNord 2003:516. Retrieved August 8, 2008. ↑ 35.0 35.1 J.G. Canadell, C. Le Quere, M.R. Raupach, C.B. Field, E.T. Buitenhuis, P. Ciais, T.J. Conway, N.P. Gillett, R.A. Houghton and G. Marland, Contributions to accelerating atmospheric CO2 growth from economic activity, carbon intensity, and efficiency of natural sinks. Proceedings of the National Academy of Sciences (2007) 0702737104v1. Retrieved August 8, 2008. ↑ Impact of Emissions, Chemistry, and Climate on Atmospheric Carbon Monoxide: 100-year Predictions from a Global Chemistry-Climate Model. MIT. Retrieved August 8, 2008. ↑ Drew T. Shindell, Greg Faluvegi, Nadine Bell, and Gavin A. Schmidt, "An emissions-based view of climate forcing by methane and tropospheric ozone." Geophysical Research Letters. 32:4. Retrieved August 8, 2008. ↑ Methane's Impacts on Climate Change May Be Twice Previous Estimates. NASA. Retrieved August 8, 2008. Jacob, Daniel. Introduction to Atmospheric Chemistry. Princeton, NJ: Princeton University Press, 1999. ISBN 0691001855. Lerner, K. Lee, and Brenda Wilmoth Lerner. Environmental issues: essential primary sources. Detroit, MI: Thomson Gale, 2006. ISBN 9781414406251. Solomon, S., D. Qin, M. Manning, Z. Chen, M. Marquis, K.B. Averyt, M. Tignor, and H.L. Miller (eds.). Climate Change 2007: The Physical Science Basis. Contribution of Working Group I to the Fourth Assessment Report of the Intergovernmental Panel on Climate Change. Cambridge, UK: Cambridge University Press, 2007. ISBN 9780521880091. The NOAA Annual Greenhouse Gas Index (AGGI) Earth System Research Laboratory. What Are Greenhouse Gases? EIA Brochures. What are greenhouse gases and how much are emitted by the United States? US Energy Information Administration. NOAA CMDL CCGG — Interactive Atmospheric Data Visualization NOAA CO2 data. Methane-Eating Bug Holds Promise for Cutting Greenhouse Gas. Media Release, GNS Science, New Zealand. Carbon Dioxide is Good for the Environment 2001 paper by John Carlisle at the National Center for Public Policy Research. Environmental Effects of Increased Atmospheric Carbon Dioxide paper by the Oregon Institute of Science and Medicine. This page was last modified on 14 July 2017, at 23:22.